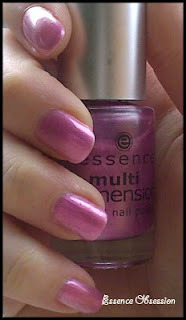 NOTD: Essence Obsession - Cherry Colors - Cosmetics Heaven! Today my nail broke at the end, so I had to shorten it a bit, but I couldn't find my glass pile?! So I used a random one I found in the house.. It broke because my nails were bare naked (I took off the nail polish after it got off like a sticker on my thumb!) and my ring finger nail started breaking in layers *cry*. I wanted to try this nail polish so hard! But honestly it's really pretty but I got tiny air bubbles, which I don't like. But I didn't use any base coat, because I hate it when I can take off nail polish like a sticker, so ew! And I think that's a reaction I have because of the base polish. We'll see. 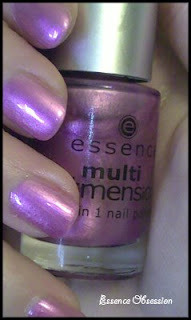 This color is a pretty light purple with a mixture of pink, it also has a frost finish! So true, it's a little obsession. Outside light: Inside light: Do you girls hate it too, when air bubbles create on the nail polish? What do you do to fix it?